Brian Sims is a 2006 graduate of Enterprise High School in Enterprise, Alabama. 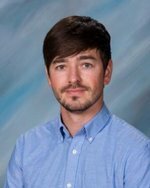 He holds a Bachelors of Science degree in Music Education from the University of North Alabama in Florence, Alabama. Before attending UNA, Brian traveled the country as a touring and studio musician. He is a member of the American Society of Composers, Authors and Publishers with song writing credits on multiple tracks performed on radio, television, and film. While at UNA, Brian was a member of many ensembles including the Marching Band, Wind Ensemble, Symphonic Band, Studio Jazz Band, Jazz Combo, Shoals Symphony Orchestra, and the Low Brass Studio. Brian and his wife Kayla are both music educators and live in the Madison area. He is an avid Boston sports fan and collector of all things related to The Beatles.